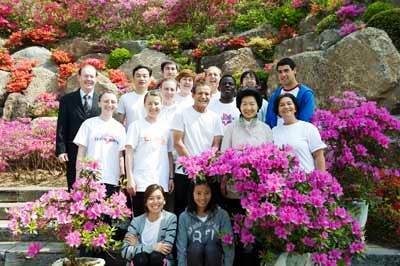 The '2013 Purification Azalea Festival for the Inheritance of Heavenly Fortune' was held successfully from May 3-5, 2013. It was the first Special Great Works to be held after the Foundation Day and many members from around the world attended to receive the grace and love from heavenly parents, True Parents of Heaven, Earth and Humankind, Heung Jin Nim and Dae Mo Nim. In the morning of May 9 Dae Mo Nim took commemorative photographs with the 40-day workshop members who worked really hard for the success of the Special Great Works.